Looking for one of the craziest and most unique dining experiences of your life? This is the Bugs Cafe, an insect restaurant in Siem Reap, Cambodia that specializes in bug dining. Every item on their menu has bugs of some kind in it — tarantulas, ants, scorpions, grasshoppers, and bug larvae. You get the picture. They even have a “Bug Mac” full of insects. The Bugs Cafe was started by a French expat and a Khmer chef, and it’s a fusion of the local Cambodian culture as well as the influx of tourism from everyone visiting the famous Angkor Wat temples, which bring millions of tourists to Siem Reap every year. Cambodian locals have been eating tarantulas as a delicacy for years, which is probably a sad holdover from the days of the Khmer Rouge communist regime, when food disappeared and the local population was starving; but the tarantulas are still eaten here today, and as a tourist it’s a cool novelty experience. I mean really, where else can you find a restaurant like this?! Sounds appetizing, right? I ordered an insect skewer (which comes with a big scorpion and water bug) and the tarantula donut. 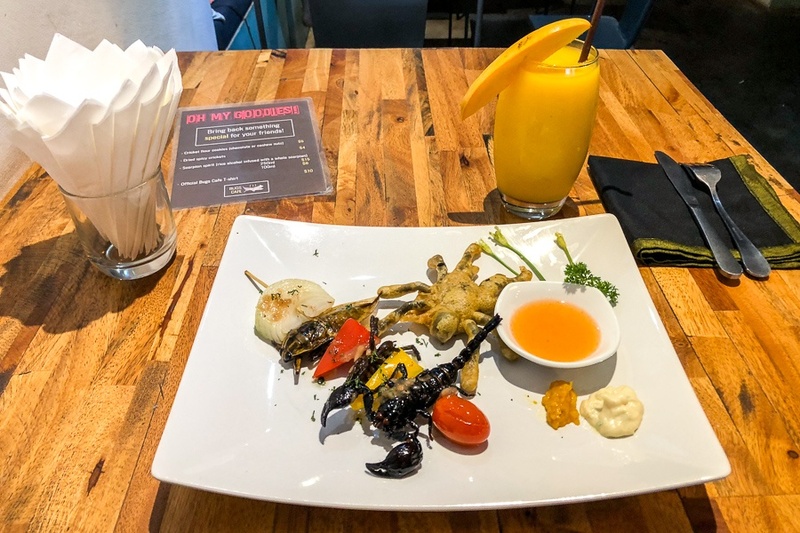 This would normally come with a total of 3 bug skewers and 3 tarantulas, but the waiters were kind enough to let me do one of each (one scorpion skewer and one tarantula) and just pay half the normal price. Which is good, because I had no intention of eating THREE of these things in a row. The waiters here are funny and friendly, so they can explain anything on the menu if you need help, or reassure you when it comes time to pop those bugs into your mouth. Bug kabob + tarantula melt. Yum. The tarantula is marinated, coated in tempura and deep fried. It was weird, but not as bad as I expected; the crust kind of covers up the fact that you’re eating a tarantula. The scorpion was bad, and I couldn’t finish it. It was extremely crunchy, especially the claws, and it kind of felt like I was chewing on rocks. The hairs on the scorpion tail were also stiff and nasty. I had no interest in even trying the huge water bug. At least when you eat a tarantula or scorpion you get bragging rights; “I ate a water bug” just doesn’t sound very cool. Deep fried tarantula. Crunchy, yet satisfying. Bug kabob, complete with a grilled scorpion, spider, and huge water bug. Side note: if you’re planning to visit Cambodia and this restaurant made you worried about the food options there, do not fret. Siem Reap has a lot of normal cuisine that is great; it’s not all bugs. After I had my fill of bugs, I went to Khmer Grill and had a bona fide meal with $1 beef kabobs and other good stuff. The Bugs Cafe is located in the city center of Siem Reap. You can get there on foot or by taxi. Like most restaurants in Cambodia, US Dollars are accepted. The items on the menu range from $3 spring rolls all the way up to a $27 bug platter. My meal here was $9.